Happy almost Thanksgiving! I’ll be celebrating the holiday in earnest this week on the blog (minus drunk uncle Gary and the inevitable family drama) with delicious healthy recipes for your Thanksgiving dinner and beyond. Now, onto the good stuff: the food. 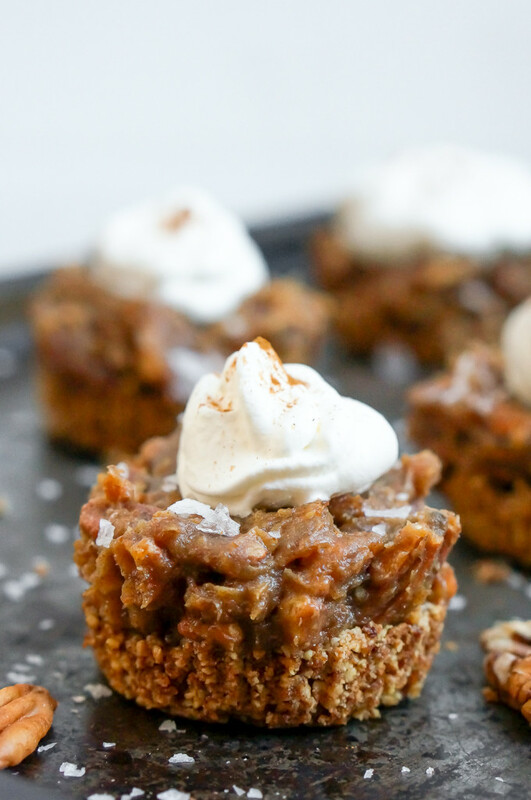 These Salted Caramel Pecan Pie tarts are a riff on one of my favorite Thanksgiving desserts, Pecan Pie. While the base of a pecan pie is actually quite healthy – the pecans – in traditional recipes, those innocuous nuts are doused in both cane sugar and corn syrup. This version of healthy pecan pie uses a simple almond meal shortbread to create a buttery, grain free crust. Atop that is the recipe’s secret, superstar ingredient: the caramel sauce. 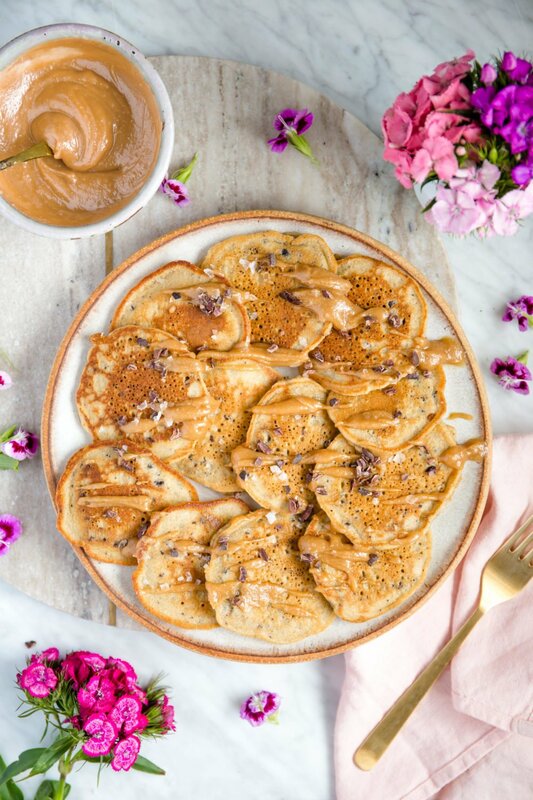 The caramel sauce uses only dates, almond butter, vanilla and coconut oil to make something that tastes exactly like refined sugar laden caramel. I love using my Vitamix to make this, as it creates a truly silky smooth result, but if you don’t have one, I recommend using a food processor: a normal blender won’t work nearly as well. The trick is starting on the lowest possible setting, then letting it go around a bit, scraping down the sides if necessary, until it begins to become creamy. 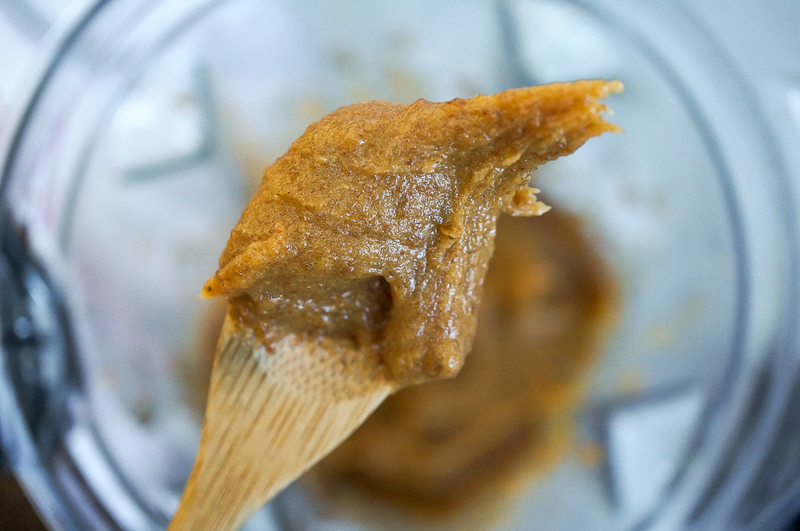 Then you can turn up the speed for the final few seconds, resulting in an ooey-gooey, perfect healthy caramel. 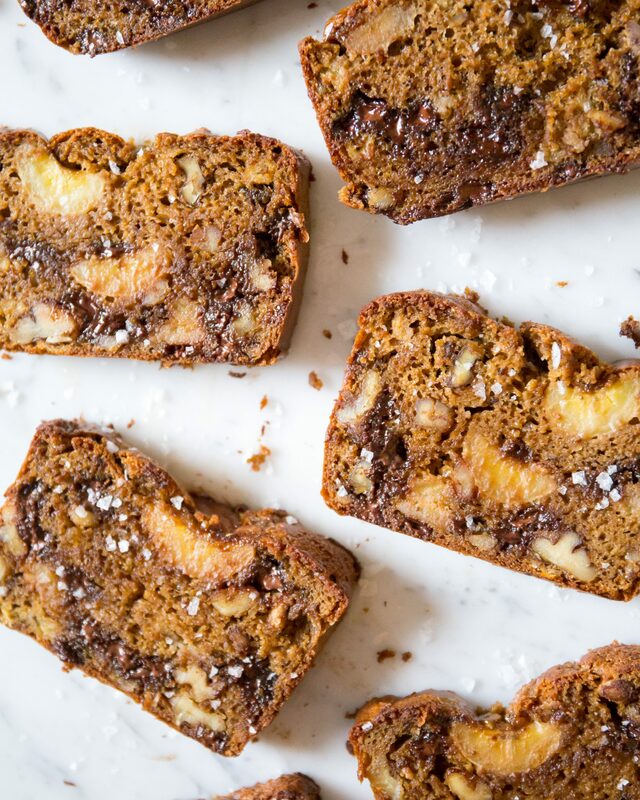 A sprinkle of Maldon sea salt takes these truly over the edge: all of the flavors of the nutty, buttery base with the toasted pecans and the sweet, gooey caramel sauce are enhanced and highlighted by those crunchy little white nuggets on top. Topped it with cream and voila: a Pecan Pie Tart that even guests who hate traditional healthy food won’t be able to get enough of. I’m absolutely obsessed with these, and I’m sure you will be too. They also come together surprisingly quickly, and there’s something so fun and cute about perfectly portioned tarts (I’ve always preferred them to pies myself). Remember to stay tuned for the rest of the week for more awesome Thanksgiving recipes, and don’t forget to enter to win your own Vitamix (details are at the beginning of the post). 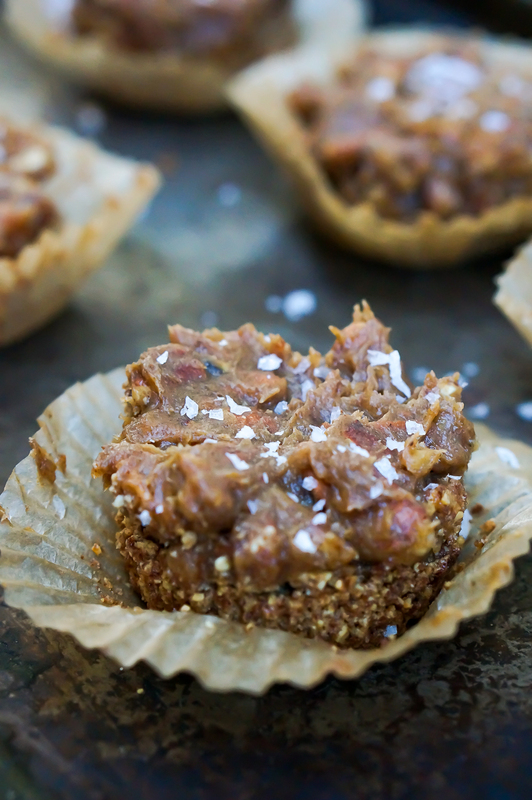 Enjoy the healthy pecan pie goodness! This post is brought to you by Vitamix, one of my beloved brand partners. I only work with brands I truly love and adore; thank you so much for supporting the companies that make Sprouted Routes possible. Preheat oven to 325 degrees. Mix together all ingredients, pressing together with your hands, until it can be pressed into a ball. Let sit in fridge for 10 minutes, then distribute evenly between 12 baking cup-lined muffin tins, pressing the dough firmly down in the base. Use your thumbs to create an indent in the middle of each muffin tin, so that it resembles a traditional tart shape. Place muffin tin in freezer for 10 minutes, then bake for 15 minutes. 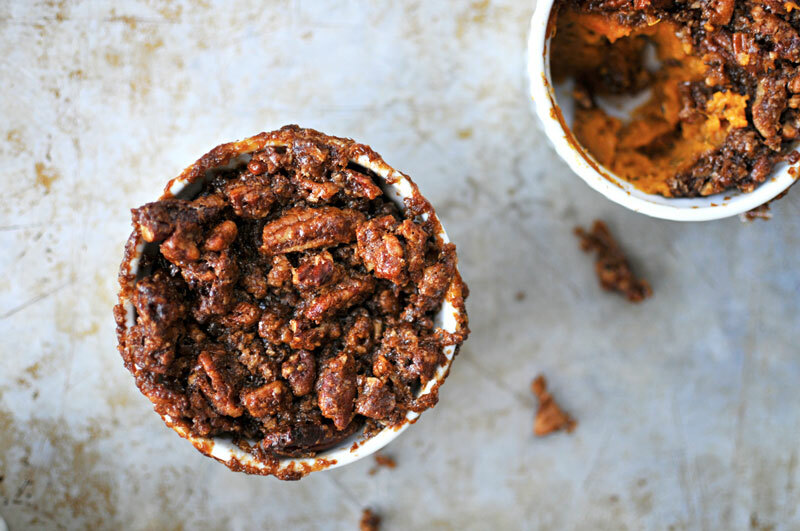 Let cool completely (at least 15 minutes) before adding caramel/pecan topping. Spread the pecans in a thin layer on a baking sheet and pop into the oven after you take the shortbread out. Let toast until fragrant and golden brown, usually about 10 – 15 minutes, then remove from oven. 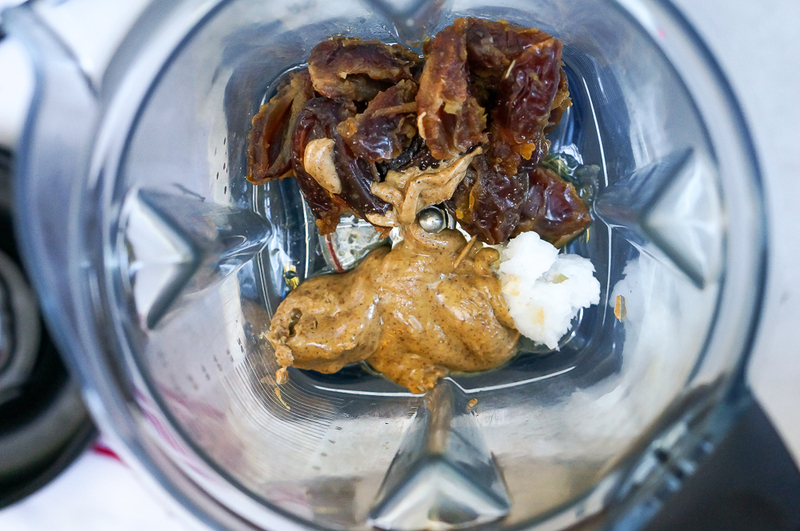 Load all ingredients into Vitamix or food processor. 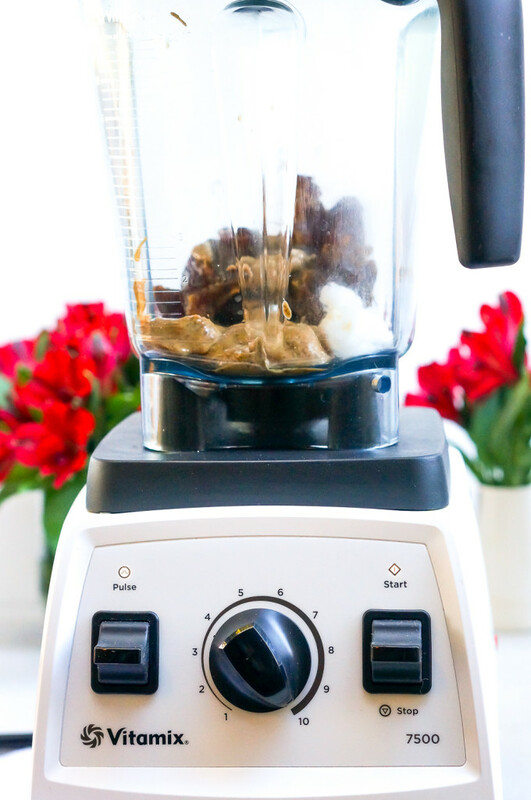 If using Vitamix, start on the lowest setting and blend until all ingredients are combined, then go up to 4 or 5, scraping down the sides, until the caramel is creamy. 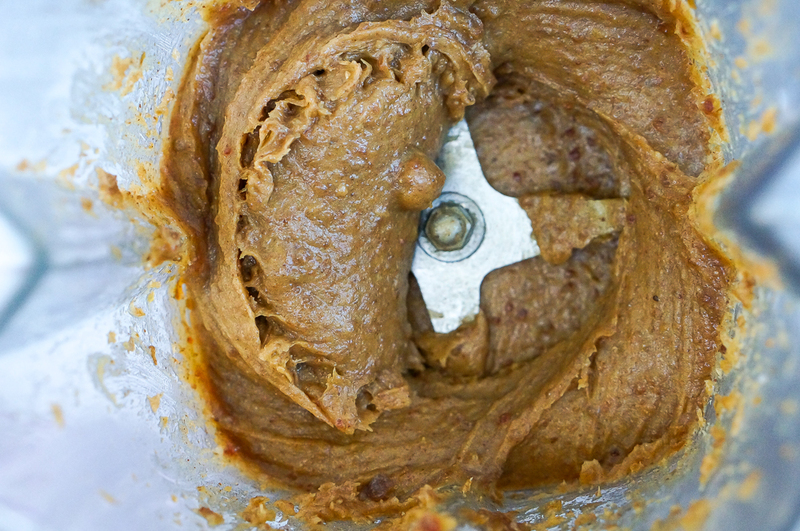 If using a food processor, process until creamy. Mix together toasted pecans and caramel sauce, then press into muffin tins, pushing the caramel/pecan mixture down to really fill the space. Sprinkle with Maldon sea salt, then let firm up in for 10 minutes in the freezer before topping with whipped cream of choice and serving. Makes 12 tarts. These will keep, fully assembled, for up to 4 days in the fridge. Wait until just before serving to top with whipped cream. Delicious! Will definitely make many times! Thank you! I e made these twice now. They are specaracular. Even my mother who has diabetes can eat these. Sooooooo good. Thank you for the recipe. Dates should be boiled 10-20mins. Are we just looking for the dates to be softened? You don’t boil the dates – you just soak them in boiling water. And yes, the goal is to soften them! I subscribed, liked you on FB, started following you on Instagram and shared this recipe on FB but was unable to tag you. 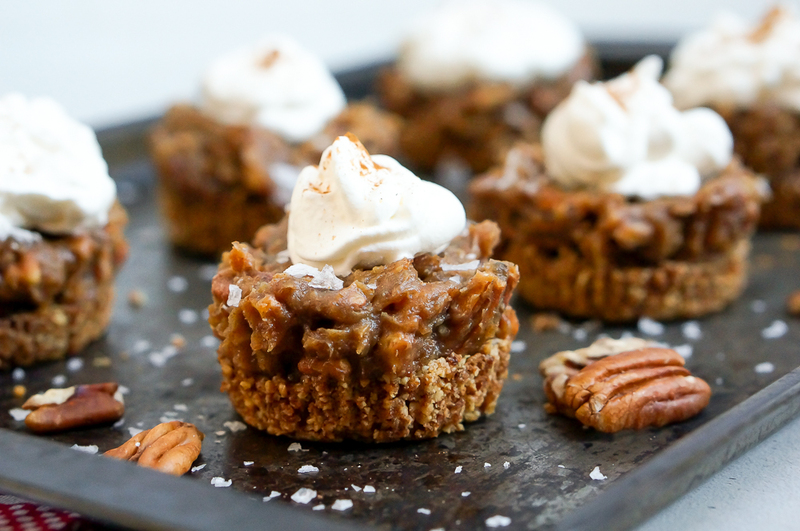 I am excited to stumble across your blog and am super excited to try these Salted Caramel Pecan Pie Tarts, I haven’t had pecan pie or tarts since becoming a vegan! Having a Vitamix would sure make it easier to enjoy these yummies! Hope I get entered! Oh my! These look AMAZING. I’ve got a vitamix on my Christmas list! Liz, I run a fitness blog and would LOVE to include your recipe on a roundup of healthy Thanksgiving dessert options. Would you mind if I use a picture of yours and link people over to your website? Can I make this as a pie instead of as individual tarts? They should be kept in the fridge, for up to 3 days. Just wait until right before serving to top with whipped cream, if you’re doing that! I will never crave pecan pie ever again after making and eating these. Guiltless deliciousness. I used pink Himalayan salt on the top and left off the whip cream. Oh my goodness I am so confused. Heehee. I thought there was going to be an announcement at midnight so I stayed up. Is the announcement later? 🙂 Also I made these with homemade coconut whipped cream. It was so YUMMY! Thank you Ms. Liz! I followed all the steps for the giveaway! Cannot wait to try out this recipe, Vitamix or no Vitamix. These are going to be my contribution to Thanksgiving! I can’t wait to try this caramel! We would love this! Please pick us my husband just found out he is diabetic and we were talking about how nice it would be to have a vitamin tonight!! I shared and signed up but I dont know how to tag @sproutedroutes on Facebook . Hi Margot! You can share the post directly from my Facebook page (I posted it a bit ago, and just click “share” on that post). Then I’ll be sure to see it! Thanks for entering! Big fan of that salted caramel flavor and have been looking for a healthy alternative to cream! Can’t wait to try. Wish I had a Vitamix! ????? Hi! Want to try these this weekend as a birthday surprise. This recipe will fill 12 standard-sized muffin tins? Thank you! The tarts were a huge hit today! Thank you so much. It ended up not to be a surprise as my niece saw the FB post that I shared on my page and asked it I was going to make it for today’s get-together. I got busted before we even gathered! Thanks again! 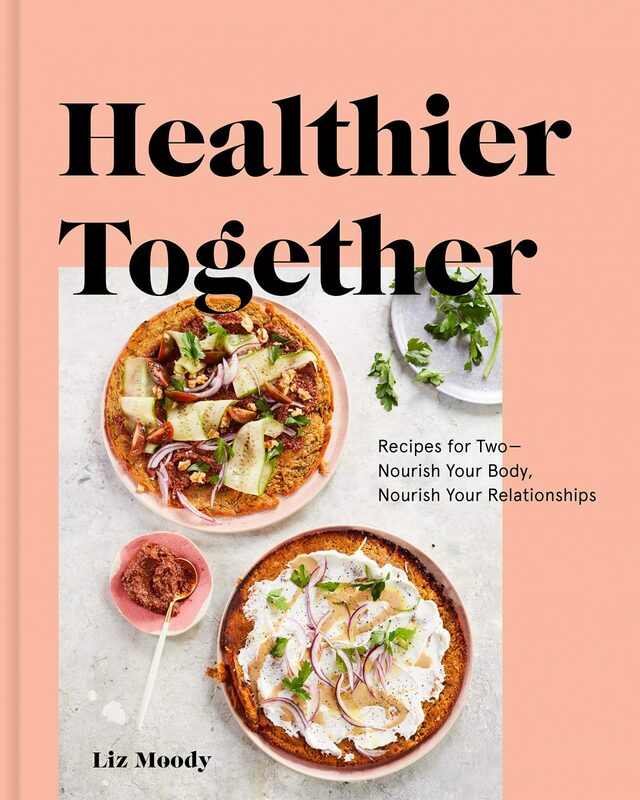 Beautiful website and recipes are quick and healthy! Yay! Come back and let me know how you like them! Excelent! Delicious and most important its healthy! I followed on Twitter, retweeted and signed up for email. Please enter me in our Vitamix giveaway. You’re entered, Laura! Good luck! These look amazing! I am going to try my hand at them for Thanksgiving next week. Couple of questions: Should I use whole pecans, or pieces? 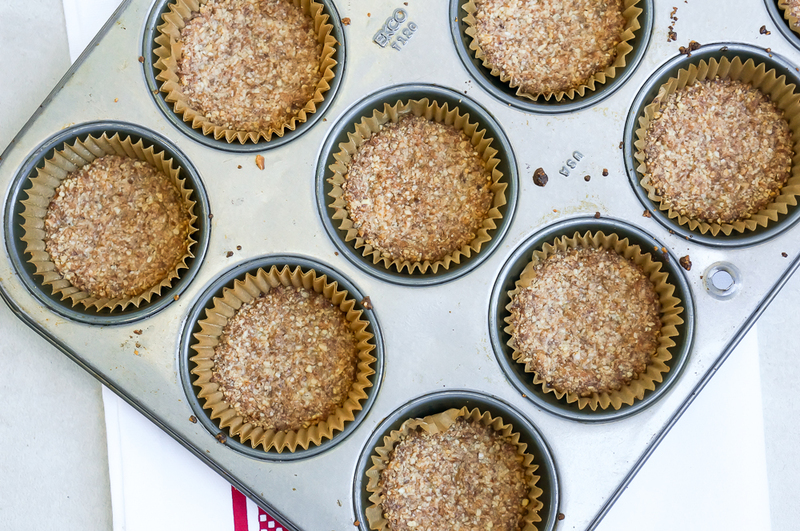 If I wanted to do mini muffin tins, how much time should I adjust the crust baking? I’d like to make these the night before, and then travel (couple hours in car) the day they’re to be served, how should I store them after assembling them? (after the 10 min in freezer, but before the whipped cream). These look so delicious! Will definitely be making these over the weekend! WOAH!!! HOLY YUM! these little treats are definitely going to be making an appearance on my thanksgiving menu! I liked your Facebook page, shared this recipe,and tried to tag you but tagging didn’t work. Tried again via my browser. FB took me to the share and write a message page. I wrote a message and tried again to tag you. (Signed up for your email updates too.) Tagging wouldn’t work and when I hit share it would not post. Help! How can I enter your contest for the Vitamix? Hi Carol! I’m sorry to hear that – Facebook is so annoying sometimes! Go ahead and share the link without tagging me, and I’ll consider you entered in the contest! making these for thanksgiving! thanks for the recipe!